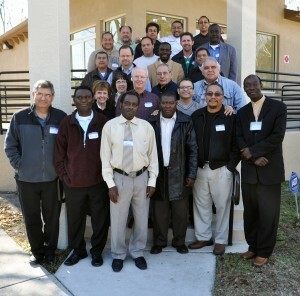 Participants in the first Grace Brethren Ethnic Leaders’ Consultation, January 11-14, 2011, Tampa, Fla. — Left to right, row 1 — M. Guerena, H. Joseph, O. Joseph, D. Cardichon, A. Betoney, C. Casimyr; row 2, J. & J. Bell, G. Leiton; row 3, S. Guiles, P. Guerena, R. Soto; row 4, D. Guiles; row 5, C. Valenzuela, D. Nonhomme, J. Munoz; row 6, J. Marquez, J. Forero, B. Baughman, P. Davids; row 7, C. O’Dell, J. Molina, S. Joyce, S. Diaz. 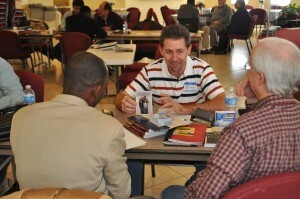 For three intense days last week, pastors, elders, and others interested in reaching their own ethnic groups in North America for Christ met at Iglesia Comunal Cristiana, a Grace Brethren church in Tampa, Fla., for the first-ever Ethnic Leaders’ Consultation. Among those attending the event, which was held from January 11 to 14, were individuals affiliated with Hispanic, Haitian, African American, Native American, and Japanese returnee ministries. Brian Baughman, pastor of Fuente de Vida, a Grace Brethren ministry in Elkhart, Ind., shares during some structured fellowship time at the Ethnic Leaders’ Consultation. Early in the week, the participants spent time getting acquainted, sharing their own stories and that of their families and their ministries. They learned about Grace Brethren ministries around the world and in the United States. On Wednesday evening, they celebrated three-fold communion then joined the Tampa church for a time of praise, worship, and prayer. Thursday they began to look at their soil, examining the current realities of ethnic populations in the U.S. and discussing how to motivate Anglo churches (and even their own) to reach ethnic communities in North America. In the evening, they heard the story of Dadje Samuel, the Chadian evangelist/apostle who died April 25, 2010, and was responsible for more planting more than 250 Grace Brethren churches and points of light in Africa. Gerardo Leiton, right, pastor of Iglesia Comunal Cristiana, Tampa, washes the feet of Haitian pastor, Phanorol Davids. As the meetings reached a conclusion on Friday morning, the group looked ahead. At the encouragement of the organizers, they decided to take the important first step of organizing into ethnic coalitions (African American, American Indian, Haitian, Hispanic, and other). Each coalition will work to promote unity and teamwork among its members. Representatives from the coalitions will meet to plan future nation-wide gatherings. More photos of the event may be found at Facebook/FGBC World.